Everlast Troughed Trapezoidal Profile has an angular profile with a robust design. With an aesthetic look, they are a modern alternative to traditional corrugated metal roofing sheets. Troughed Trapezoidal profile is also available pre-painted in a variety of colors. Everlast Aluminium Troughed Trapezoidal Profile is a perfect choice for roofing and claddings of industrial as well as domestic applications. 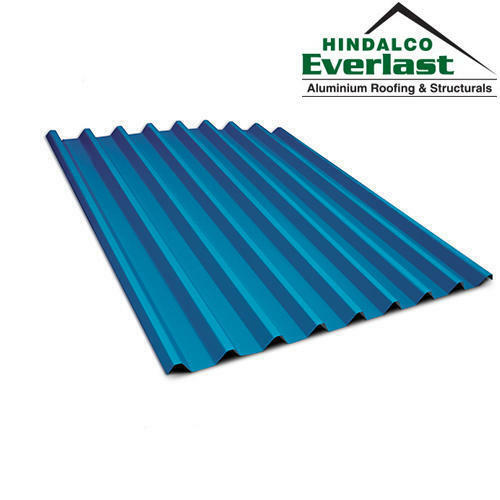 Everlast has the following variants-Everlast Super Aluminium Roofing Sheet, Circular Corrugated Sheets, Everlast Roofing Structural, Tiled Profile Sheet, Modern Troughed Sheets, Stucco-Embossed Aluminum Sheet. An industry leader in Aluminium and Copper, Hindalco Industries Ltd., the metals flagship company of the Aditya Birla Group, is the world's largest Aluminium Rolling company and one of the biggest producers of primary Aluminium in Asia. Its Copper smelter is the world's largest custom smelter at a single location. Established in 1958, we commissioned our Aluminium facility at Renukoot in eastern Uttar Pradesh, India in 1962. Later acquisitions and mergers, with Indal, Birla Copper and the Nifty and Mt. Gordon copper mines in Australia, strengthened our position in value-added Alumina, Aluminium and Copper products. The acquisition of Novelis Inc. in 2007 positioned us among the top five Aluminium majors worldwide and the largest vertically integrated Aluminium company in India. Today, we are a metals powerhouse with high-end rolling capabilities and a global footprint in 13 countries. Our consolidated turnover of USD 17 billion (₹ 104,000 crores) places us in the Fortune 500 league.